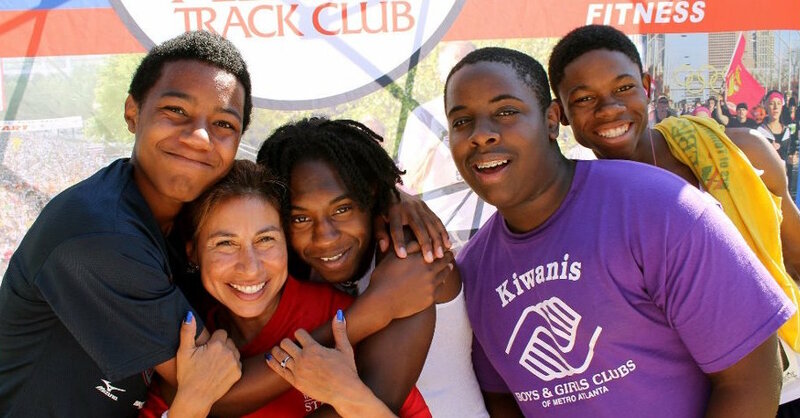 Our goal is to help children understand (especially when running in relay races or the 1 mile fun run at any given race) it’s NOT about finishing first; it’s about HAVING FUN while finishing. 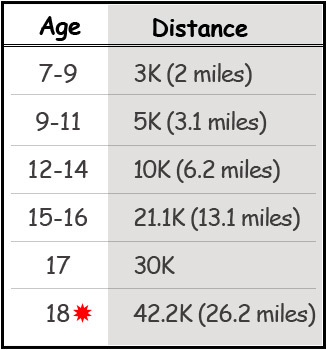 Also try to help young runners understand that each child develops different capabilities at different times. MDA-Journal of Sports Medicine reported that any child under the age of 18, having a frequency of “high mileage” running (i.e. 26.2 miles or more, in one setting) will magnify the biomechanics of the young runner. Therefore affecting their growth plates, which is why children are not encouraged to run a marathon (26.2 miles in one run) under the age of 18 years. 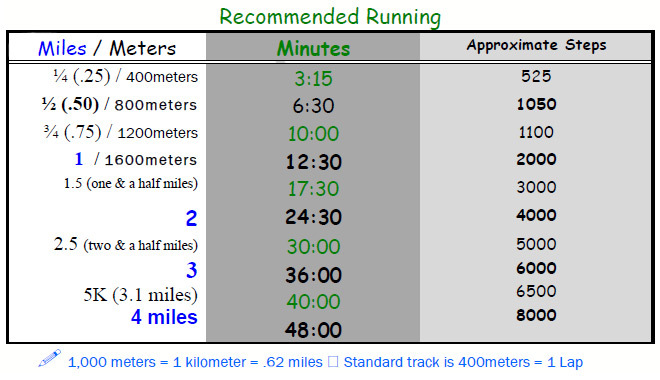 Please use the chart(s) above and below as indicated for respected miles a child may run, in accordance to Road Runners Clubs of America and the MDA. Help children understand (especially when running in relay races or the 1 mile fun run at any given race) it’s NOT about finishing first; it’s about HAVING FUN while finishing. Also try to help young runners understand that each child develops different capabilities at different times. Not every youngster is able to play football, soccer, baseball, basketball, etc., but every child can be a runner (which is a foundation of other sports and will help them excel in their respective activity). We express that “Running” is one sport that they will be able to do throughout their lifetime. Training and fun runs help build self-confidence. Balanced Running improves the quality of life through running and walking, kids begin believing in themselves and realizing they can accomplish a “reachable goal” and have self-belief that they can “finish” their race. There’s plenty of time for them to be competitive, we help them understand the concept of enjoying the sport as an “individual” as well as being part of a “team”, plus having the discipline to continue with their “finishing” goals.We invite you to join our “Hour of Running Power”. Children learn various activities such as: warming-up, easy stretches, core strength/training, intervals, relays, cool down, stretching, etc., as well as youth leadership. Runners should expect to be breathing heavily when they run. Their body needs more oxygen when it is working hard than when at rest. After running for a couple of minutes, the breathing should settle down to a more comfortable rate. If a runner is breathing so hard they cannot talk in short sentences, they are running too fast and should slow down. The runner’s breathing will be heavier when going up hill or against a strong head-wind. Whether a runner breathes through their mouth or nose is up to them. As they increase their effort, they may find that nose breathing will not allow them to get enough oxygen and will breathe more comfortably through their mouth. A side stitch or cramp is very common, especially with new runners and can be very painful. They are unpleasant enough to make some people stop running altogether. This kind of cramp is not from eating or drinking before running, but associated with the diaphragm. If runners run to fast and are taking quick, shallow breaths, they are more likely to get a stitch. Remind them about proper pacing to help avoid stitches. One technique to get rid of a stitch is to inhale through the nose and exhale forcefully through the mouth for about 30 seconds.